Nicola's No Ordinary World is made from recycled objects and gourds. : Other People's Blog - Scoop.it! Other People's Blog - Scoop.it! Because my miniature models are created out of recycled objects this blog is just up my alley. I am always trawling the net for ideas. People can be soo amazing at times. 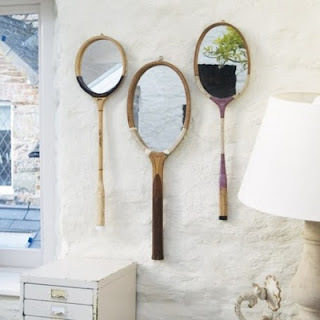 It is a blog that deals in creating interesting artwork and home decorating objects out of re-cycled bits and bobs. I've included some photos form the site and if you would like to see more please click here. 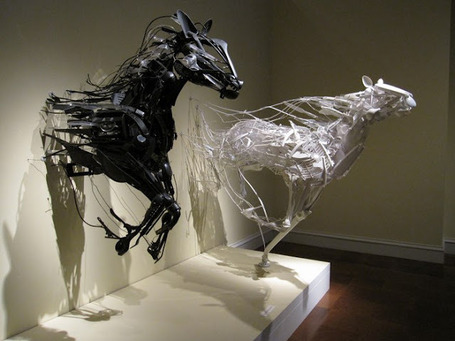 Made out of knives, spoons etc. Amazing. Sayaka Kajita Ganz then click here. 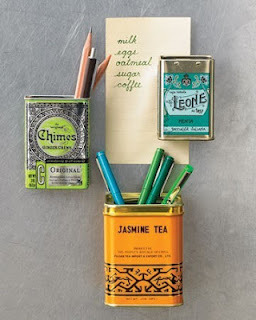 Old tea containers made into fridge magnets. Just make sure your magnet is a stong one if it has to hold the weight of pencils as well. Old tenis and squash rackets made into mirrors. The world is awash with the refuse of the human race, but what if some of it could be reused? In years gone by a place of sanctuary was required to hide from the fears infesting the mind. A world of fantasy grew all around comforting the spirit. Then imagination was not enough. It was necessary to touch what was once thought, tread the paths woven in the mind, to feel the essence of one's dreams, to walk through what was no ordinary world. With gourds in one hand and decades of casts off from a life of hording in another, order grew. With plastic, string, balloons and more, plants, fungi and creatures appeared beneath the fingers that wove them into existence. Homes appeared, small, delicate and secretive, filled with the waste thrown away by human beings. Layers of life surrounded them. A touch of nature was added. The earthiness of the gourd embodied them with an essence that made one believe that this could all be real. As stories began to be told through the written word, the models, entwined within, both grew in size, width and depth. Strangers looked upon a world that was like no other. It was tactile, full of layers, it drew them in and, with their imaginations ablaze they too now wandered the paths that lay before them lost in the innocence of a childhood long since gone. Who is N J Tierney? Some years back I would have asked the very same question who IS Nicola but with time and a detailed examination of my past I now know the answer and I have peace in that knowing. I am Nicola Jane Tierney. After I was born into this mad, crazy and amazing world on a Sunday in Twickenham, Middlesex, England my grandmother placed a bunch of snowdrops next to my crib. From the age of three I grew up spending hours creating things. It is what has followed me all my lfe like threads flowing through a tapestry. I make 'things'. When I was nine the family moved completely to the otherside of the world. To a strange and forbidding country called Australia. It is a country that I now love. For over 40 years I have wanted to build a miniature world that is so big that I, and others, can walk through it. Why? Good question. I don't know why. Well yes I do but I have no room here to say and so this is where my heart lies and where my feet walk towards. I shall create my gourd houses until the day I drop off the twig. All images within my blog may be used for personal use only. Contact me for other uses. Picture Window theme. Powered by Blogger.